The Dual Personal Body/Dash Car Camera is a body worn, high-definition, dual video recorder for law enforcement with true HD 1080p recording with its 125 degree angle lens. This device can capture 8 hours of footage per charge, and with its automatic night vision you can get great video even when it's pitch black. 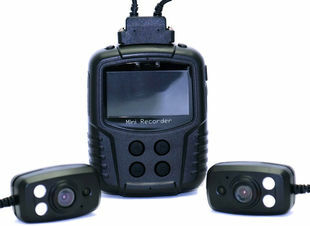 The 2.7" LCD allows you to review videos, photos or audio recordings in the field. The Dual Personal Body/Dash Camera also doubles as a dashcam. With the extra length of the Dual Camera cord you can easily have one camera watching your dash and one watching your rear. The PRBody2Cam also comes with plenty of accessories for mounting your cameras and DVR. In addition, the device has a SIM card slot for GPS tracking, including functions for SOS, Geofences, and more. The Dual Personal Body/Dash Car Camera has plenty of settings and customizable features to adjust the device to your liking. You can adjust video quality, choose between single or dual camera mode, and much more. It also has support for 10 different languages.